“The photographer” is not a great selfie enthusiast, but now and again, when the opportunity presents itself, I succumb. 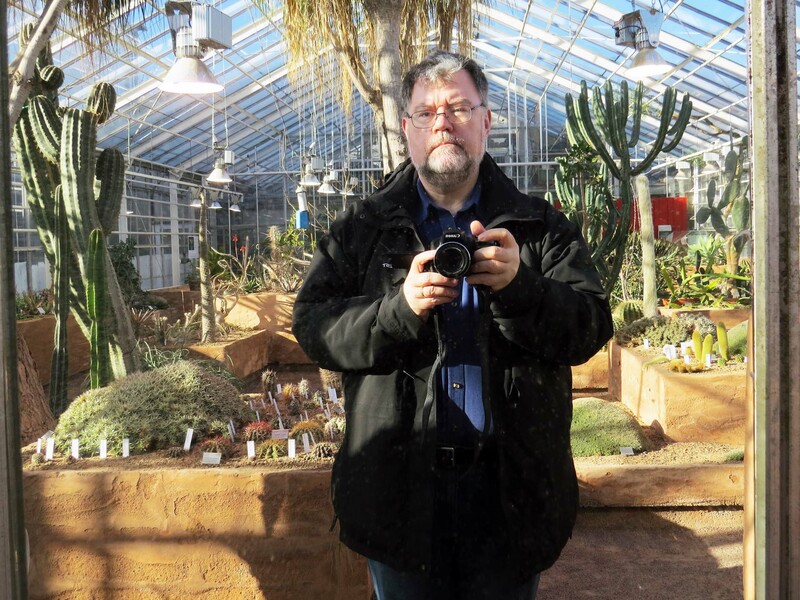 Last week’s photo was taken in the tropical glass house at Gothenburg’s Botanical Gardens – this week’s comes from the cactus house of the same venue. There is a mirrored wall at one point which cries out to be used for selfies. I answered the cry – and posted this on my daily photoblog at GBG365 on 19th March 2014. “The blogger” missed posting on Wednesday as I spent most of that day travelling. I flew from Belgium to Sweden, from Brussels to Gothenburg, from Uccle to Hisingen. I’m going to be resident here for the rest of March and a good bit of April as I’m overseeing the renovation of our kitchen. Both the photographer and the blogger hope that won’t further interrupt my publishing schedule. But I fear it may. To be honest, I spent most of the morning of the 15th worrying about whether I had remembered to pack everything I would need. (I’m still not sure.) Apart from any other consideration – I have to declare my Swedish taxes in April. And tax declarations, always and everywhere, are an event to give one pause. Other things on my mind on the 15th included my mother’s birthday (she’s 95 now), and whether I’d posted her card in good time. I was also thinking about the temperature difference between Sweden and Belgium. It looked to be about 8 degrees. Was I travelling in the right clothes? I sweated in my winter coat in the Brussels metro, but I was glad I’d worn it. Glad too that I’d packed a woolen sweater in my handluggage. A damn cold wind greeted me at Landvetter. Anyway, I got here and here I am. And at least I now have access to my original photos and can post sharper, more high-definition images for my photos of the week. Not only for today but also for the weeks gone by. View them all here.